Dallying In The Dirt, Issue #072 --- The seeds are here and my new cheap pots are ready. The seeds are here! The seeds are here! My procrastination in ordering some of the seeds has been overcome and I will spend the next couple of days in the basement happily spreading seeds over soil. First I must spend a few moments with the calendar, predicting the the three planting dates for 2010. 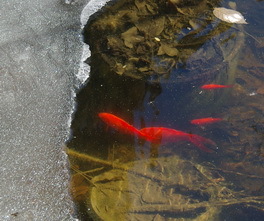 In the first week of March when the snow should be deep and restful, the fish are coming up to the large open hole in the pond ice. The Snowdrops are blooming and there is only a vestige of snow in the dark corners of the garden. We do have this feeling of impending doom. We are going to pay for all this +7̊ - 10̊ weather. My neighbour and I were discussing setting up a little wager, trying to pick the date of the great snowstorm of 2010. I was speculating about the first week of April. Anyway, back to the seeds. I have been converted. I used to be cheap and now I am environmentally sensitive. I didn’t change. I was just ahead of the rest of the world. 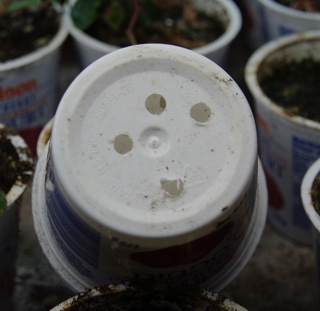 Have a look at my seeding containers that I create from plastic garbage. It really is wonderful when the rest of the world catches up to me. All of my children can now brag about me instead of trying to hide my penurious tendencies. The Onions will be the first to find the soil, quickly followed by a few Tomatoes and Peppers. It really is too early for them but my attempts to get the first fruit on the block always have me starting a few, ridiculously early and having them in 15cm pots, or large yogurt tubs, before they ever see the garden. I know that it is a silly waste of space but when you are a competitive gardener time and money mean nothing compared to the taste of that first ripe Tomato. In the proper order of things a few of the oriental vegetables such as Bok choi will be seeded next. 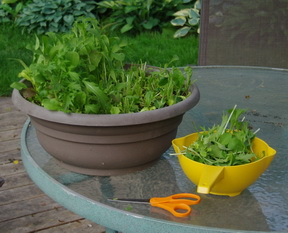 The big shallow container of Mesclun will be started in the next few days so that it can be set outside as soon as that late snowfall passes. The other cole crops such as Rapini and Broccoli will also be in the soil soon. They need about 6 weeks before they hit the garden soil and I’m predicting a mid to later April planting out date. That’s the day when the soil is dry enough to crumble and can then be worked and planted in to. Inside the solarium, which received its new floor today, the Hibiscus is thriving with little sign of the usual infestation of spider mites and whitefly that indicates that pruning time has arrived. Nonetheless it will have to be pruned soon or it won’t have started to regrow sufficiently to put on a good show this summer. 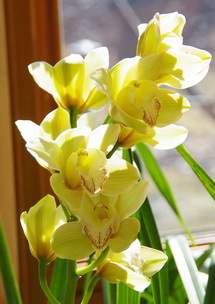 Of my six pots of Cymbidium Orchids, that take up a lot of space, only one is paying the rent this year with a stalk of light yellow flowers. They didn’t get enough sunshine outside last summer and they were probably brought back inside too early. They like to get a significant cool period to initiate their flowering cycle. Many of you are much quicker than I am. I mentioned in the last issue that I would be posting my upcoming speaking engagements and many of you had visited that page before I actually go them posted. They are there now. I had an irritating experience this past week. You all know that I live in Canada but like to purchase seeds from a variety of vendors. I received a notice to collect a package from the post office. Excited about the arrival of a package of seeds from the U.S. I rushed to the post office. Having already spent some $30 for expedited shipping, because I was late getting my order in, I was asked by the Post Office for another $20. Two levels of sales tax, one of which they are not supposed to apply and an $8 charge from Canada Post for delivering an expedited parcel. That’s a total of about $50 to receive a package of seeds that was valued at just under $100. Won’t make that mistake again. Do not ship seeds from the U.S. to Canada by expedited post. I will try regular post again and see what happens. How much time do I want to spend fighting with the various government agencies to try, most likely unsuccessfully, to get some of my money back. I’d rather go and plant the seeds. Ray asks? We grow many Japanese Maples in cedar pots and over winter them in our garage. This year of course, they are beginning to swell in the garage. Some are showing green on their buds. What is best for them? Take them out to slow them down or keep them in the garage to fully leaf out? Ken Answers! Either solution is a gamble. If the buds are really breaking their dormancy and starting to develop then a severe cold spell could freeze them off, if they are outside. If it just stays cool then they will be better off outside. If they start to leaf out in the garage without sufficient light to sustain their growth then they will get weak and spindly and may get fried when they finally hit strong light. Gardening is always fun but unpredictable. I would probably stay in the garage as long as possible.